Small bars of high purity (99.9%) Gold metal (atomic number 79). 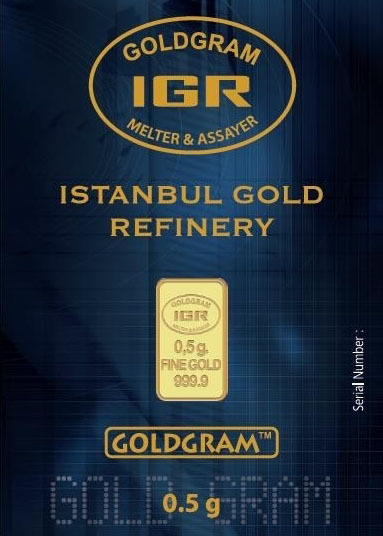 Ideal for element collectors of those conducting experiments/producing alloys with pure Gold metal. Compared with other metals, Gold is the least chemically reactive of all, but can be dissolved in Aqua Regia (a mixture of Nitric & Hydrochloric Acids). Gold dissolves in Mercury, forming amalgam alloys, but does not react with it. Gold is the most malleable and ductile of all metals; this single 1/2 gram bar can be beaten into a thin 2 foot square sheet. Chemically, it is unaffected by air, moisture and most corrosive reagents. Gold also strongly reflects infrared radiation. Its melting point is 1947.52 °F (1064.18 °C.). Available in small thumbnail size ingots as shown above. Weight & purity are certified.